Compatible with 2016 Apple Macbook pro 13 inch A1706. Simply connect the USB-C cable to your apple devices to recharge the battery. The USB-C cable it also supports USB 2 for syncing and data transfer between USB-C devices. For iPad Mini , iPhone Series , iPhone X, For iPhone 8, For iPhone 8 Plus with TYPE C plug. * 30 days money return guarantee. * 24 x 7 email support. Note: During use, if there is a certain temperature increasing is normal phenomenon. Recommends pairing it with your 13-inch MacBook Pro with Thunderbolt 3 (USB-C) ports for optimal charging performance. 61W USB-C Power Adapter offers fast, efficient charging at home, in the office, or on the go. 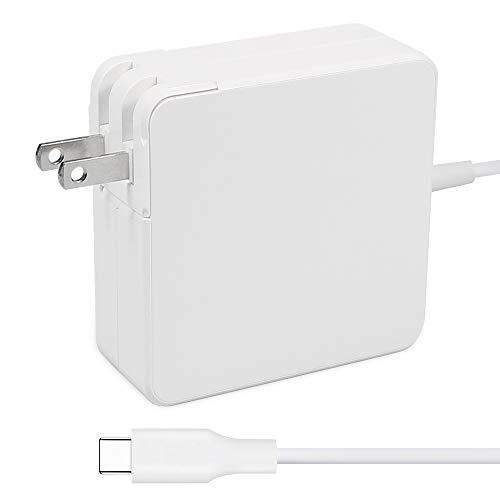 What you get: 1x61W USB-C Power Adapter, 1xFree USB-C Charge Cable(2M), 12 months warranty and friendly customer service. View More In Chargers & Adapters. If you have any questions about this product by HUSAN, contact us by completing and submitting the form below. If you are looking for a specif part number, please include it with your message.